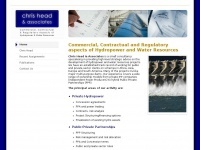 Chris Head and Associates is a small consultancy specialising in providing high-level strategic advice on the Commercial, Contractual, and Regulatory aspects of hydropower and water resources development. The web server used by Chrishead.co.uk is located in Great Britain and run by Webfusion Internet Solutions. On this web server 41 other websites are hosted. The language of those websites is mostly english. A Apache server hosts the websites of Chrishead.co.uk. XHTML 1.0 Strict is used as markup language on the webpages. The website does not specify details about the inclusion of its content in search engines. For this reason the content will be included by search engines.